Never let it be said there isn't variety in the old stuff I feature on here!. I think this turned up in an antique shop a couple of years ago, and was swiftly snapped up thanks to the great old illustration on the cover. I am sure this dates to the 1930s, to my un-informed eyes the style of the lettering suggest that this probably harks back to the art-deco era. A handsome coach (rather than a single deck bus) is shown powering along, and if anything has a continental (perhaps Germanic) look to the vehicle. 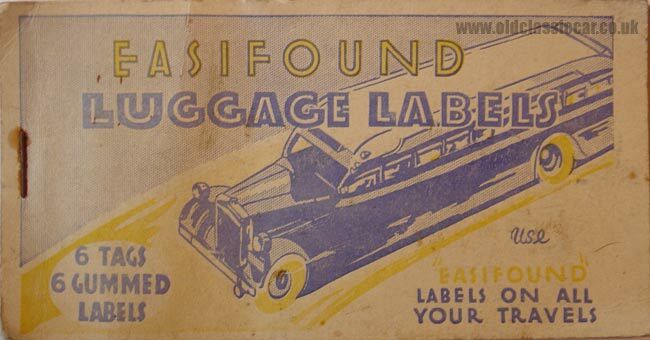 Continental tours were taken by the more well-healed members of the British public in the 1930s, and they'd be the kind of people who would have bought a pack of the Easifound Luggage Labels, in order that their expensive luggage didn't get misplaced during their trip. We are advised to 'use "Easifound" labels on all your travels', and the pack would contain 6 tags and 6 gummed labels. A few of the labels have been used from this book of labels, I wonder what journey they would have been used on? ?